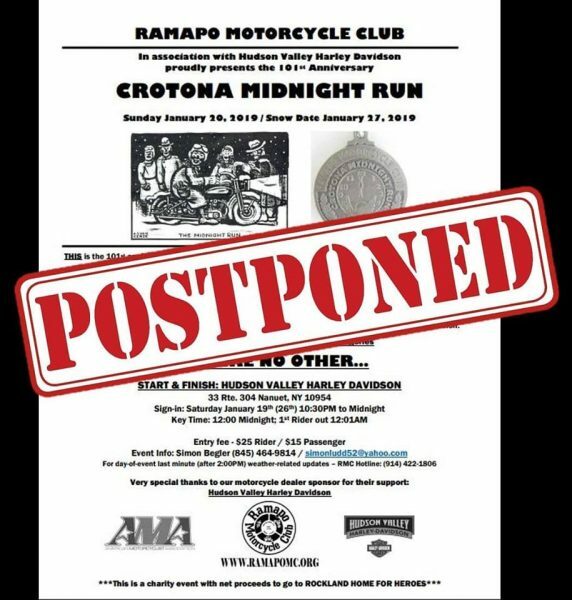 NORTH GRANBY, CT – The Facebook notification from the Ramapo Motorcycle Club arrived Thursday while I was sitting at my computer working my checklist for my second Crotona Midnight Run. It had the word “Postponed” stamped across the event flyer. Due to the weather forecast of snow, rain and anything else possible to fall from the sky, the 101st run has been postponed for a week. As a Motorcycle Safety Foundation certified instructor and someone who promotes safety and skills practice, I know postponement is a sound decision. However, as a daily rider, it feels like a slap in the face and wholly contrary to the run’s original mission and heritage. 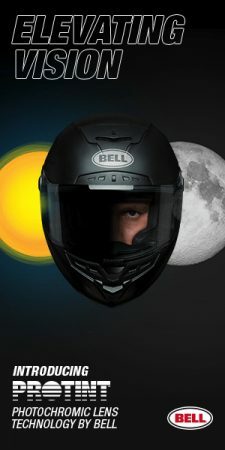 This ride began with hardened, rough and tough motorcyclists who tested their mettle in the middle of winter for not much more than bragging rights. This was not a ride for just anyone. Mark Zimmerman wrote about it in “Motorcycle Cruiser” magazine in 2009. “The inaugural Crotona Midnight Run took place on New Year’s Eve 1911. It’s taken place every year since, except for a hiatus during the first and second World War,” he recalled. Last January, I rode in the 100th run, which was also delayed due to weather. In the weeks leading up to it, I prepared by riding in sub-zero temperatures and snowstorms and freezing rain that resulted in black ice conditions. I recall one night after midnight when I rode up on a motor vehicle accident in near zero visibility. High wind, snow and black ice resulted in an overturned S.U.V. It took me almost one-eight of a mile to come to a stop, wrestling to keep my BMW K 1200 RS upright so as not to hit the fire truck blocking the road. The fireman could not believe I was on a motorcycle. When he watched me turn the bike around – they had closed the road – I remember him saying “I hope you make it home!” as I rode off to ride for several more hours in that storm. I saw this as my earning my ticket to entering the legendary Crotona Midnight Run. 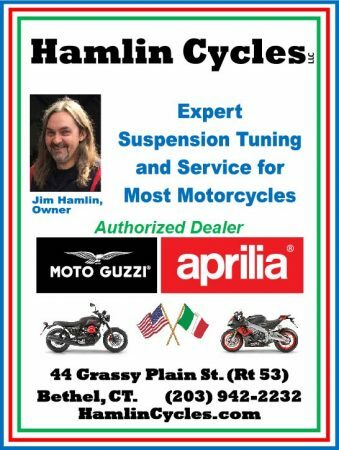 When Ramapo Motorcycle Club postponed the run last year, I was a bit relieved actually. Not only did my safety voice agree, but it gave me another week to prepare. Again I saw my conditioning as “qualifying” to even be in it. This ride is legendary! 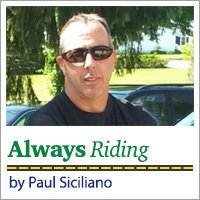 I later spoke with Piet Boonstra, a man the American Motorcyclist Association named their “outstanding road rider” in 2002 about how he took first place in past runs and he recalled that the conditions – no matter how severe – never caused a postponement. The gear (or lack of it, compared to today) became more innovative and I’m not talking more amps to your heated gear. It was stuff like some neoprene duct tape applied to a new wool sock that Sears just released in the catalog the Christmas prior to the run. Like a Marine, these guys adapted and overcame what they were dealt. Piet even shared with me a story of how he even challenged the time keeper at a check point in a blizzard, which demonstrated to me what kind of rider entered the Crotona Midnight Run. I’m not alone in my frustration over this weekend’s scheduled run being postponed. Another entrant, Michael Aldea from New Jersey, complained in a since-deleted Facebook post, “The reason all finishers were given a medal is because … the Midnight Run was a challenging, medal worthy achievement. Riders conquered darkness with weak lights, poor roads and cold, often inclement weather on not very reliable machines. I will say again that the Ramapo Motorcycle Club did the right thing postponing the event. In today’s climate they didn’t even have a choice. That is the sad truth. But they did postpone it. The Crotona Midnight Run no longer exists in its original and intended form. The Crotona Midnight Run has perished. It should be re-named the Ramapo Midnight Run and downgraded from achievement to something just above a pleasure ride. These days, it seems, everyone must get a trophy. Tell me I am wrong. I’m now considering dropping out because some practice runs have already been much, much tougher than the postponed run will be. What’s the point? Well, Paul, I know you gave it your best. No we did not have extreme weather conditions. But I am will to bet the route and the temperature proved to be a challenge. I am sure I pulled off my 11th win! I saw the faces of the riders that made it to the halfway point (11 of 13) I can say they all looked TOUGH to me. Nothing to prove just getting a chance to say I did it! I hope now that you had your shot with the sidecar rig you can forgive Ramapo for being safe and waiting a week to host this historic event. I look forward to next year when you will have another chance to beat me. If your main reason for participating is so you can brag to yourself or others what a tough rider you are, you’re missing the point. It’s supposed to be a fun & crazy ride, not a life-threatening endeavor. Postponing it for snow fall makes complete sense since riding on fresh snow is about the most stupid thing you can do on two (!) wheels. 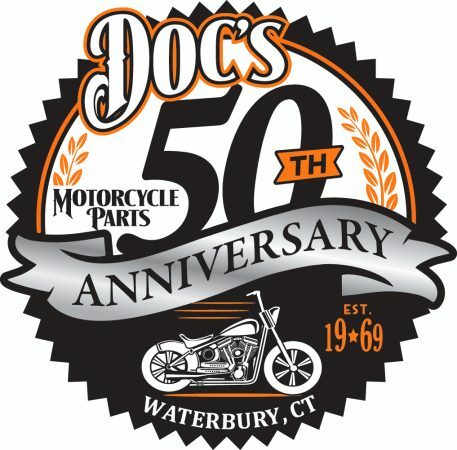 Back in those mythical golden days they simply did not have accurate 5-day weather forecasts (so there was no way to postpone it on short notice), safety gear, reliable motorcycles, etc. That doesn’t mean riding all through the night, in the cold, with black ice, crossing dear, following meticulous directions (especially for today’s GPS spoiled riders), is not enough of a challenge. 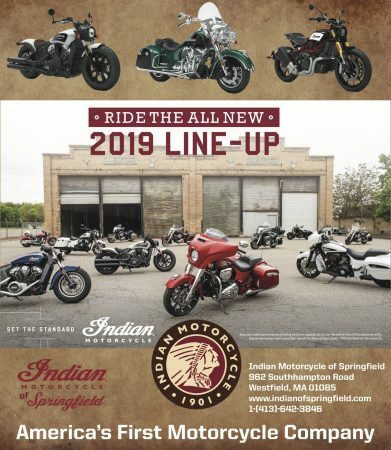 Why do you think there were only 29 motorcycles last year, 6 of which didn’t even finish? If it’s such a pleasure ride, I’d expect many more riders with winter riding blues participating. And who really cares about the “trophy”, which really is just a commemorative coin? Just ride and shut up about it. Paul is an inspiration and a gentleman. 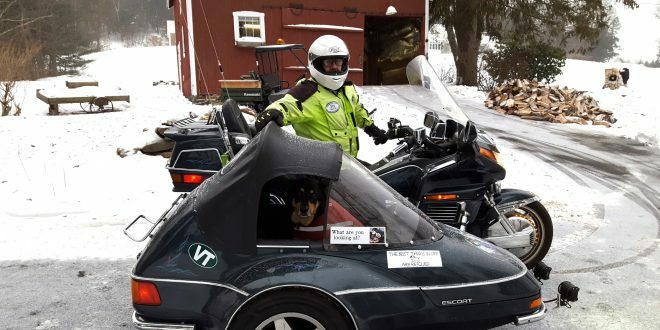 He went above and beyond by raising additional funds to donate for this ride. Him wanting to participate and complete this run under the conditions set forth by previous rides is not unreasonable. I can speak from personal experience, it’s quite exciting to know you’ve accomplished something only very few chose to participate in. 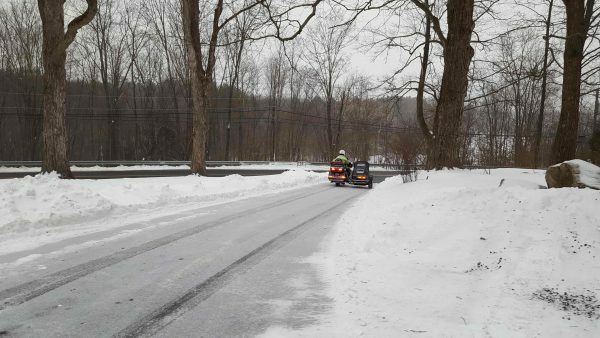 I have been winter riding in New England since 2009 and LOVE being part of the calculated CRAZIES who ride when others don’t think its possible (CT Polarbears). I commute to work in the winter and go on many scheduled Sunday rides hosted by the Polar Bear Grand Tour that usually take us out of state. The feeling of being part of a small percentage of people who are willing to participate in something that others are either unwilling or unable to do feels pretty good. Plus the look that non-riders give me is priceless. That being said, this midnight run is too CraZy for me at this point in my riding career. I’ve spoken to other riders who described the unsavory conditions they experienced while participating. In my opinion, those who have participated and completed this run are part of the one percenters who within the world of motorcycling, do just a little more than the rest. I always looked at those who participated under the conditions that were explained to me as elite. By postponing this ride, you changed the rules to the game. The original elite status no longer applies. Those that accomplished the ride under the original conditions will now have to stand in the same winning circle with those who are playing under the new rules. It’s a simple fix. Change the name of the ride. Make it politically correct because, of course, some will be offended. Call it what it really is, let those who finished in the past decide. They earned that right. For those who complete the “??? Midnight run” in the future know that you will be starting a new chapter. This is getting blown out of proportion. Paul is a passionate rider who, in my opinion, was frustrated by the postponement. He had been practising for the ride at night in all sorts of weather for several weeks. He even altered his sleep schedule to be better prepared. On top of that, he raised almost $3,000 for Alzheimer’s research for riding the event. 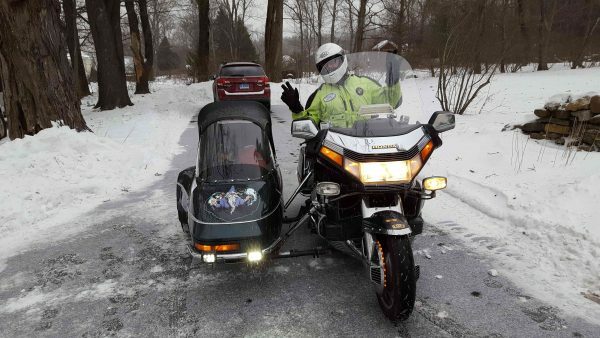 He was ready to go no matter the weather and knew the sidecar was going to give him an advantage in the snow. He wanted to win badly and I admire his competitive spirit. You shouldn’t ride it again, Paul. After all, you have proven yourself to be above us. Why bother? Since you have motorcycling mastered, why ride at all? Did this run one time, three years ago. Got hit by a car 45 minutes in, 200 feet into New Jersey. Shoulder and hand still not back to normal after surgery. Can’t say I’d be enthusiastic about doing this run, again. Hey Paul, first you have your right to an opinion, just like an a hole we all have one! You have participated but one time in the historic event. Forget about the crazy men and women that decide to challenge the conditions to ride a motorcycle (2 or 3 wheeled). You seem to forget about the army of men and women that will stand out in the same conditions waiting for you to arrive at a checkpoint. So much effort is put into a timed run. For what? You think the club should send out their members so a hand full dummies can try to prove how tough they are. Please Paul keep your a hole opinion to yourself. BTW I am a 10x WINNER and don’t need to prove to anyone how tough I am! If you think that it’s right to postpone for safety reasons but also think that it’s wrong, because.. why exactly is it wrong? Are you objecting to the use of modern motorcycles? Heated gear? What exactly is your beef? Oh, wait, you don’t think it manly enough? There’s a coast-to-coast ride for vintage machines, if you think that riding old iron is where it’s at. There’s an endurance ride to the four corners of the U. S. if that’s what floats your boat. You could probably find a bunch of riders who will ride to the arctic if cold weather is your drug of choice . I respectfully disagree, Paul, and I think it’s beneath you to disrespect anyone willing give up a good night’s sleep in the middle of January to go motorcycle riding with friends and strangers.